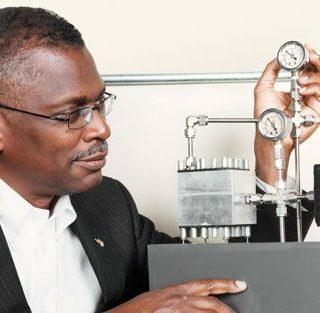 Lonnie Johnson is a bona fide rocket scientist and brain-busting inventor. He built a robot out of scrap metal and helped develop interplanetary missions for NASA and the stealth bomber program for the U.S. Air Force. He’s also the guy who came up with a massively popular toy called the Super Soaker — dreaming it up one day while tinkering on a heat pump idea in his bathroom. And over the years, his pressurized water gun has earned more than a billion dollars in sales. “Yes, it’s done extremely well,” Johnson deadpanned in a phone interview Thursday from his office in Atlanta. Today, Johnson is founder and president of Johnson Research and Development Co. Inc., where he’s still dreaming up new technologies, including better ways to power cars, airplanes and even spaceships. And at 7:30 p.m. Tuesday, he’s set to appear at the Virginia Air & Space Center in downtown Hampton to talk about the power of perseverance in converting brainstorms into revolutionary technologies. His appearance is part of NASA Langley Research Center’s monthly Sigma lecture series. It’s free and open to the public. The center is located at 600 Settlers Landing Road. 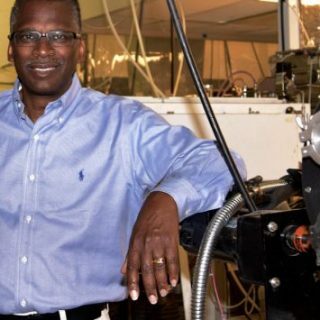 “(He) can share lessons learned regarding how to successfully implement innovation and be a successful inventor,” said Julie Williams-Byrd, a Langley physicist and electro-optics engineer who recommended Johnson as a Sigma speaker. Born in 1949 in Mobile, Ala., Johnson grew up tinkering and taking things apart. He dismantled his sister’s doll to see what made the eyes close and built a go-cart out of junkyard scraps and a lawnmower engine. He represented his segregated high school in a 1968 science fair — the only black student to compete. His compressed-air-power robot, the “Linex,” took first prize. 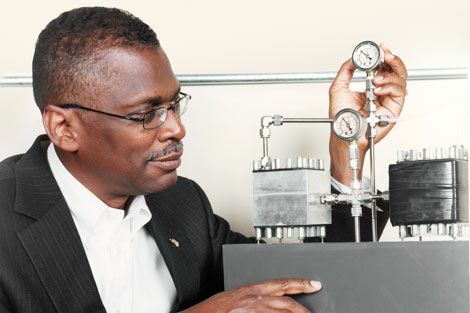 After earning a master’s degree in nuclear engineering at Tuskegee University in 1975, Johnson went to work for Oak Ridge National Laboratory and the U.S. Air Force. It was there he helped develop the stealth bomber program. Four years later, he was hired at NASA’s Jet Propulsion Laboratory as a systems engineer for the Galileo mission to Jupiter, the Mars Observer spacecraft and the Cassini mission to Saturn. In 1982, while working at home on a heat pump that uses water instead of Freon, Johnson was trying out nozzles in his bathroom sink when one of them shot a powerful steam into the bathtub. “And from that point, I thought if I had a toy water gun that was really high pressure and something that a small kid could operate, it would really be neat,” said Johnson. That year, he also left NASA to return to the Air Force. In his spare time, he worked on his water gun. After several years of tinkering and some setbacks, he licensed his idea to the Larami Corporation, which was eventually bought by Hasbro Inc. In 1987, he returned to the Jet Propulsion Laboratory, where over the next nine years he began racking up NASA achievement awards for his work in spacecraft system design. In 1991, the Super Soaker hit the shelves and quickly became the No. 1 selling toy in the country, and one of the hottest toys of summer for years. In 1996, he also came up the idea for a toy pneumatic Nerf launcher. Today, as founder of his own technology development company and its multiple spin-offs, he has more than 100 patents, with 20 more pending. He’s working on revolutionary energy technologies — including the Johnson Thermoelectric Energy Converter (JTEC), a highly efficient advanced heat engine that can convert heat into electricity. His advances in lightweight battery technology could enable cars and aircraft to go farther at less cost. His work may have made him wealthy and successful, but he says he can’t not work. “I feel like I have been blessed with a talent or a skill, and what motivates me, really, is to try to have a positive impact on the environment and people’s quality of life,” said Johnson. He makes time to speak to the public, especially to young people, about the importance of tenacity in developing new technologies, despite naysayers or setbacks.